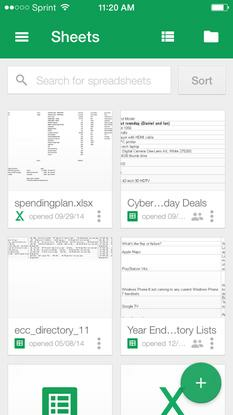 Google Sheets features a mobile-friendly interface, making it easy to view your various spreadsheets. The updates include a feature that lets users preview the results of formulas as they type, so they can troubleshoot problems without leaving the cell they're editing. Google says the new capability is exclusive to Sheets, and comes alongside other capabilities like the ability to filter data by conditions including "greater than" and "text contains." A new GETPIVOTDATA function makes it easier for users to pull information out of a pivot table, as well. Monday's update also brought new features targeted at improving Sheets's collaboration chops. The software now allows users to set up editing warnings for certain cell ranges to remind themselves and their collaborators to be careful when changing critical values. Whenever a user goes to edit inside one of those areas, they'll be shown a pop-up that lets them know it has been flagged as an area they should be cautious about changing. It's a new augmentation to the service's collaboration tools, which also allow users to confine collaborators to editing only certain cells. Google's new features come as Microsoft moves towards its upcoming release of Office 2016. That major update to the company's productivity suite will be focused in part on making new collaboration features available, which will put apps like Excel 2016 in closer competition with Google's collaboration technology.